Tips for designing your Letterhead for marketing. • Be consistent when designing your letterhead. A good letterhead design will compliment all of your other marketing materials as far as color and design. • Make sure that your logo is at least 300 dpi. This allows us to print up your letterhead with the best results when displaying your logo. • If you are going to be the only user of these letterheads then you should include your name and contact information. If it’s for your whole office we recommend keep it it as general as possible. • Our letterheads are printed full bleed that means that our ink will fill the entire page to its edges. But you should still have a margin of space to be sure that when you send your letterhead via fax or someone prints your letterhead via email your logo will not be cut off. 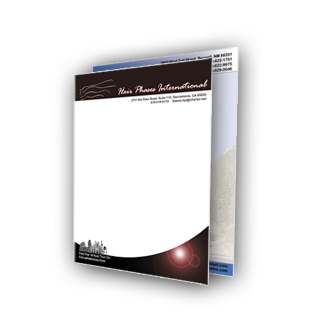 We have Letterhead printing templates available for you for free. Plus you can also design your Letterhead here online as well. Our letterheads are printed on your choice of quality print materials. As a rule we do not recommend using heavy ink in your design. These letterheads can also be used in many different ways such as. Production manuals, Inserts even memos and letters. Even for non business use having a custom printed letterhead can add some fun to writing letters to friends and family especially over the holidays. We have can print small and large quantities of personalized letterhead so please let us know. Also do not forget to get some custom Envelopes to match.